What a moment! The last golden leaves shimmer in the tree tops while rusty colors carpet the ground beneath. The days continue to be crystal blue but with a nip. We have a fire each night. Emily and her family were on the East Coast for the last three weeks. Jos has a show there and the family went along for the ride. In France there is a two week school vacation around Halloween. Jos and his friend Marcello are playing at the Brooklyn Theater for a New Audience. The run continues through the end of the week. The theater put the family up in a charming Brooklyn neighborhood where the kids got to experience American-style Halloween. The weather was wonderful for them, just as glorious there as it has been here. They visited Central Park, the Natural History Museum. the NYC public library and Times Square. It was actually not the first time the family has been there, as Jos plays in NYC for time to time. They arrived home on Saturday and since Sunday was RIck's birthday, we took the opportunity to close up for a night and have a visit with them in Paris. The first thing Zinnie did when she arrived home was to open up her costume trunk and find a princess outfit to put on. The whole family made dinner together, pot stickers, spring rolls and noodle soup. I love Paris where you can always find exotic food shops open, even on Sundays. The feast was delicious. Topped off with a fabulous homemade buttermilk cherry cake and sparkler candles. Work started up again on Monday for us, so we couldn't linger, but coming back home is always a pleasure anyway. We are happy to announce that we will be hosting another workshop at Maison Conti in October 2018 with assemblage artist, Gail Rieke. This will be her sixth intimate workshop in our atelier. I first met Gail at a course at the San Fransisco Center for the book in 2001. She was leading a workshop called The Artist as Traveler. I still have notes from her slide show which I find myself referring to from time to time. She opened my mind and heart to new ways of expressing my experiences of being in the world. I found her to be one of the most inspiring instructors I have ever had the privilege of studying with. I didn't forget her. When we moved to Maison Conti, with its large sunny studio and a place for a few art enthusiasts to stay, I proposed to her that she come and give a course here. Much to my delight, she was game, and the rest, as they say, is history. After four visits with her in France (and one to Portugal!) I count her as one of my dearest friends as well as a significant mentor. Working with her for a few days always gives me months and months of creative energy. The first year she came, in 2011, we had one lively workshop with people from France, England, South Africa and the U.S. Staying, working and taking meals together made for a wonderful intimacy, productivity and good humor. In 2013 and 2015 the demand for space was so high that Gail gave two workshops over two consecutive weeks. The workshop next October will be a bit longer and include a "field trip" to a location as yet to be determined, either in the Perche or in the Loire Valley. We will have lots of time together in the studio to develop a unique piece of art with Gail's creative spirit to guide us. There will only be this one workshop available in 2018. We already have several participants registered for this workshop and since we have a limited number of spaces to offer, we can accommodate just two more. For more information or to register, please visit our website. The holloway entrance to the forest of Montmirail, which I call the rabbit hole. October may be my favorite month of the year. This particular one is the most sublime in my memory. Of course the change in the natural world, the foliage turning colors, the bird population coming and going, and the quality of light are the things which make it special, but in addition, the weather this month has been absolutely perfect. Because our responsibilities have eased a little, there is more time for walking and enjoying the beauty of the natural world around us. 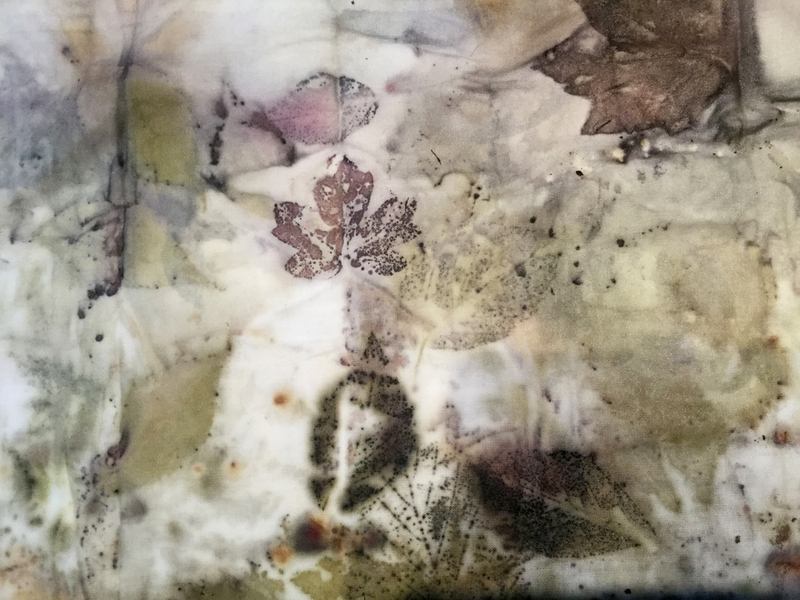 Since seeing Alice Fox's amazing eco-printing work, I have been inspired to do some experimenting of my own, The forest this time of year offers a rich harvest of leaves and plants. 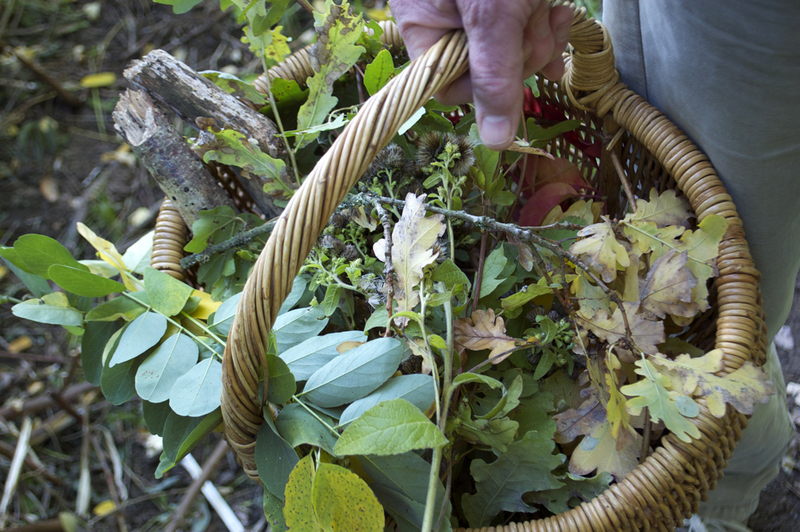 Both living and dry leaves give up color when they are bundled up and steamed in the eco-dyeing process. Last week our friend Renata invited us to have lunch with her in Alençon and afterwards take a walk in her local forest in search of seasonal wild mushrooms. She is an expert on the subject. The day was fine and the forest was radiant in the fall sunlight, the forest floor was carpeted in dry red leaves. Mushrooms grow in profusion in the forest near Renata's house at this time of year. This week it was mostly chanterelles which were available. They are small and not easily spotted, but Renata knows where to look for them. Rick followed her with his own basket and was able to collect enough for a few large meals. I spent my time gathering leaves and enjoying the play of light through the trees. On Sunday we went to Redon to a double birthday party for our dear friends Françoise and Bernard. We have known them since 1999, when James lived with them in Brittany during his junior year of high school. There was a large enthusiastic crowd. We were treated to a slide show of their lives together. They have known each other since they were children. They both turned 70 this month. We are friends with their three daughters and their families as well. They have 7 grandsons and 1 granddaughter. All of them were there, along with many other relatives and friends. It was a pleasant day and a very sweet event. As often happens in France, the party carried on into the next day. We were invited to Françoise and Bernard's house for brunch. Redon is about a three hour drive from Montmirail, so we don't see the family nearly often enough, but all of us do try to keep in touch. There is something very special for us in our connection to this family. Françoise and her daughters Gwenola and Maïwenn in the kitchen. I follow the blogs of several artist's who inspire me. Alice Fox is one of my favorites. She is a young British woman who describes her artwork as a response to the landscape and natural world. Stitch, Print, Weave. Imagine my surprise and delight when she announced in a recent post that she has an exhibition currently hanging in Le Mans, less than an hour down the road. Quelle opportunité! Rick and I wasted no time in organizing a day around visiting Le Mans and taking in Alice's show. The exhibition is at Parc Monod in a part of Le Mans we were unfamiliar with. 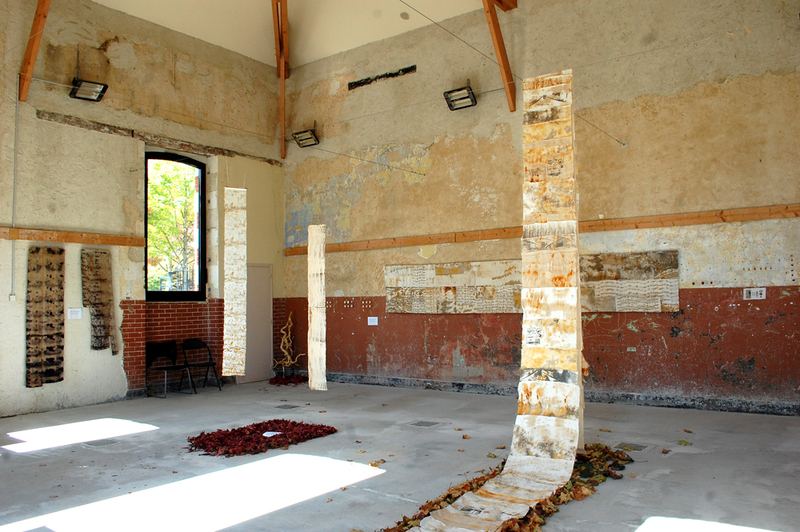 It is hanging in an old military building which happens to have decaying walls that look as if they had just reached the perfect point of disintegration to complement and harmonize with Alice's work. Alice cites Andy Goldsworthy and the Land Art Movement as inspirations. I do love what Goldsworthy does but his work is usually so ephemeral that the only way to see it is photographically. Being able to be close and personal with Alice's work gave me extra pleasure. Alice describes her process as walking through landscape and allowing her eyes to roam. She collects shells, leaves and other objects that she fancies and then takes them to her studio to add something to them. She makes delicate little embroideries inside shells and nuts as well as creating natural colors and patterns by eco-printing and rust dying. The way she puts these bits and pieces together is pure design. There is a kind of mystery and surprise to the work. Alice has written several books. I ordered this one when I got home. I can't wait to learn more about her process. Besides the pleasure of the exhibition, it turned out to be one of the most beautiful days I can remember. The sky was deep turquoise, the shimmering leaves lazily twirled through the warm air as we walked along the paths in the Park. A perfect day. Poetry. The Île de Ré, a sand dune of an island, punctuated with pine trees, is a few kilometers off the west coast of France, connected to the mainland by a suspension bridge. It has been compared to the Hamptons, as it attracts the well-heeled Parisian during the summer months and is oh so chic. Luckily for us, many of the tourists had left by the time we arrived, leaving the island not exactly empty, but pleasantly populated. It really is a charming spot, one we visited for only a few hours many years ago. This time we had two days. The weather could not have been nicer and the Atlantic was calm. We frankly spent most of our time walking along the quay, watching the boats, the birds and the clouds roll past. The island is fairly large, taking about 40 minutes to drive from one end to the other. We stayed in La Flotte, a lovely spot, with a busy port, lots of restaurants and shops, a daily market and about 3000 permanent residents, and lots of places to stay for holiday-makers. We visited Le Phare des Baleines (The Whale lighthouse) on the western point of the island. The view out to sea is spectacular. Whales and dolphins do inhabit these waters during certain times of the year. We weren't lucky enough to see any. We also visited Saint Martin, a fortified town strategically important during the 15th century when La Rochelle was a Huguenot strong hold, and the Île de Ré supported the king and the Catholic church. 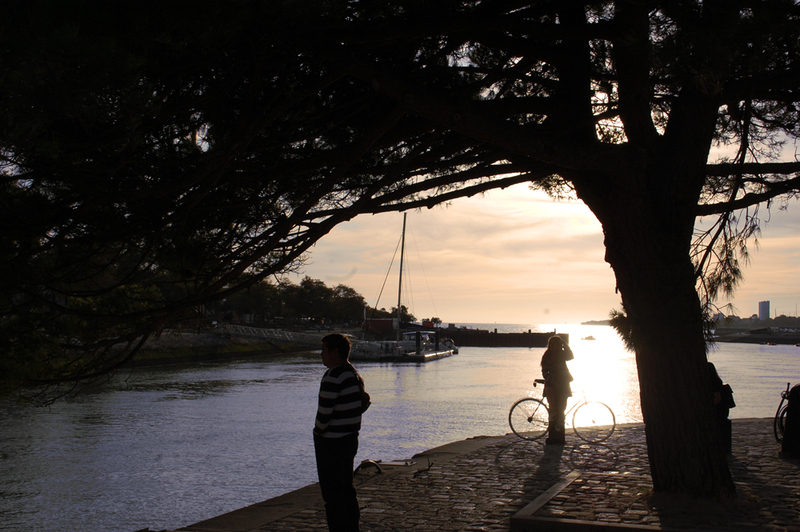 In every advertising brochure for the Île de Ré, you will see a photo such as the one above. The while house, with light green shutters and bike parked in front, is the most typical image of the island. The architecture is very harmonious, clean and crisp. There are massive numbers of bikers everywhere. It seems the most popular form of transportation. In La Flotte alone, there were 7 bike rental places to choose between. When on vacation, we do enjoy going out to meals, since in our normal daily life that rarely happens. We had lots of choices. We had lunch the first day in this little joint, called Le Corner, where homemade simple but healthy food was leisurely served up. The view over the Atlantic completed the pleasure of the moment. L'Ecailler for our last evening was a bit of a splurge. It is a Michelin rated restaurant serving wonderful sea food. Here is my entrée of 3 tartares, 3 saveurs. Glorious! One of my favorite moments was visiting the Village Artisanal in Loix, a few blocks of old warehouses converted into smart shops for island crafts people. Wood workers, ceramicists, a soap maker, coffee roaster, textile artists and the like. 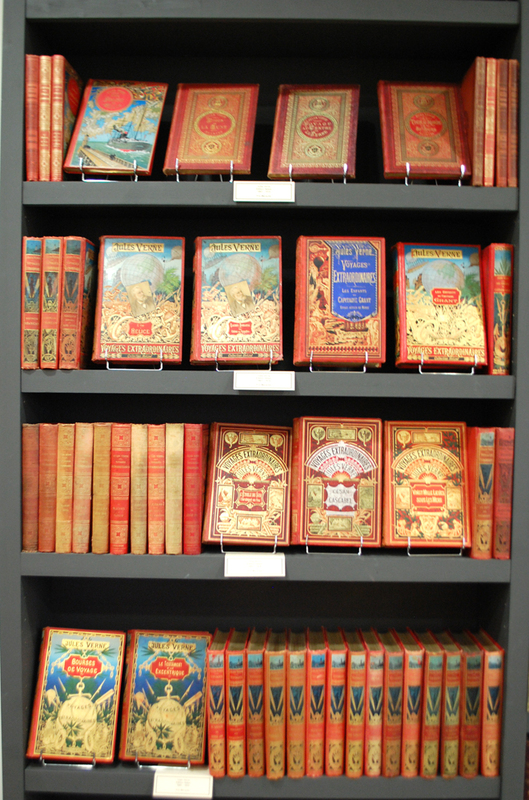 But best of all, there is an amazing antique book seller who has the most extraordinary collection of old leather bound books, maps, prints and the like, displayed more beautifully than I have ever seen before. We spent a long time just browsing the shelves. Prices were a little hallucinant, as they say here, but there was no harm in looking. As well as the bookshop, there is a world class bookmaking studio called Atelier Quillet, where one can take classes or rent bench space. Our short escape was up before we knew it, and back to work we went. Our doors are still open into the late fall and we seem to have lots of parties, weddings and celebrations every weekend, while during the week we host various business men and women who stay on for days at a time. Our season has elongated through the years, which is certainly nothing to complain about, but it is nice to have the opportunity to get away for a few days now and again. Our vacation in La Rochelle and Île de Ré was refreshing. During the summer, we have visitors seven days a week, so for months there is no days off. Now that fall has arrived, our business is primarily on weekends, which allows us to get away for a few days now and again. Last week we took a mini-vacation to the west coast of France. We started in La Rochelle, an historic port town about mid-way between Nantes and Bordeaux. We had never visited La Rochelle, although we once did stop by on our way to somewhere else, way back in 1999, and its fortified port impressed me then and continues to intrigue me. The two towers above, the St Nicolas on the left and the Tour de la Chaîne on the right, in days gone by had a large chain that could be suspended between them to prevent enemy ships from entering the harbor. There is a third tower on the port, called Tour de la Lanterne, which is the ancient light house. It has recently been completely restored and cleaned. The situation, geography and architecture make La Rochelle a very attractive destination. Our hotel overlooked the rather massive harbor and as you can see from my photos, the weather was extraordinary. Weaving one's way through the port sides, visiting the old and new harbors, exploring the fortifications and watching the boats come and go is an extremely pleasant way to spend a few hours. 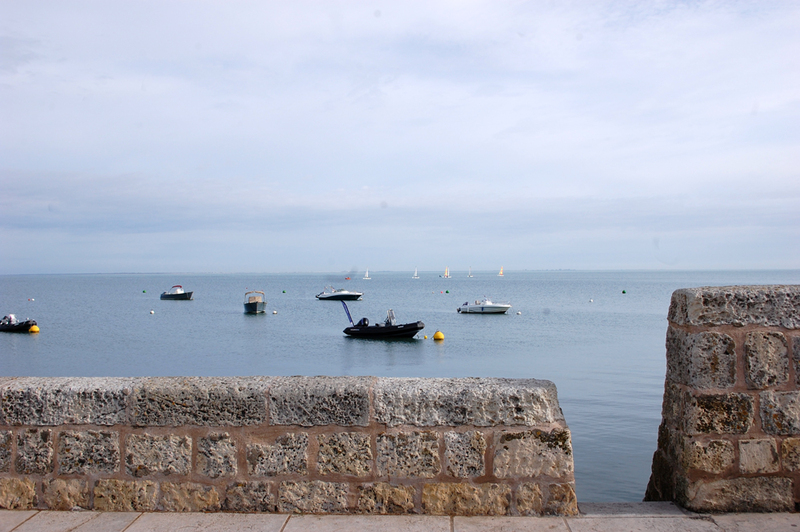 The town of La Rochelle is located on the Bay of Biscay which opens out to the Atlantic. The location has been important since before the Roman era. The actual city of La Rochelle was built in the 10th century and became a commercial and political center over the following generations, playing a significant role in the 100 years' war and the wars of religion. Today La Rochelle is the capital of the Charente-Maritime department. Apparently it has the largest pleasure boat harbor in all of Europe. Certainly it is an enchanting destination for sailors and landlubbers alike. Walking along the port as the sun goes down seems to be the favorite local pass time. The cafes and restaurants along the harbor attract many customers especially when the weather is as pleasant as it was for us. We chose to dine at the 4 Sergents, which gets a mention in the Michelin Guide. It was a gratifying experience with fresh sea food dishes prepared beautifully. I had a lobster soup I will not soon forget. I could certainly spend much more time in this charming location. I would love to have the opportunity to explore some of the back streets, but our time here was abbreviated. We were off for two nights on Île de Ré, which I will tell you about next time. Foggy morning, an unusual sight. This day went on to be sunny and warm. This week was as busy as any other, with one exception. Our clients were long-stay. Our house is generally a stop-over location, as we are not in the tourist corridor, which means that making up beds and doing laundry fills the middle of many of our days. However this week. we had several clients who came to stay for 6-8 nights, providing us some free time. Early in the week I had an eye appointment in Le Mans, so we decided to tack on a leisurely lunch in Old Town. Le Mans, most famously known for the 24h race, is actually one of the oldest cities in northern France. It was an important cross-roads long before the Romans and continued to play a central role in commerce and government through the ages. It has some of the best examples of Roman walls in all of Europe and on top of those are built a layer of beautiful buildings from several centuries. While the newer part of town is entirely uninspiring, old town is one of the most beautiful and charming enclaves in this part of the world. I never get tired of just walking through its cobbled streets. There are several very nice restaurants in town. But we chose to eat outside at one of the little cafés. We were home by late afternoon, in time to make dinner for our clients. On Sunday we had a more elaborate plan. Emily and family are just back from their annual vacation in Slovenia. We have been baby-sitting their pet guinea pig while they were away, so we made a date to meet up and transfer the creature to them. Emily recommended a place called Domaine de Chamarande, a large park and château south of Paris. We had never been. We had a delightful picnic under lusciously green trees. The grounds of the château are large and have a lake, acres of lawn to play on, a free art exhibition in the manoir and a pleasant café where we got coffee and ice cream. We feasted, walked, talked, kicked the foot ball around, threw a boomerang and relaxed on the cool grass. It was an entirely pleasant day. I leave you with another morning photo from our upstairs window taken this week. Dawn is arriving much later these days. I enjoy the pretty sky while having morning coffee. August continues on with many visitors throughout the week. It's definitely not vacation time for us! When life gets busy, it's time to find enjoyment and sustenance in small moments. For instance, one day recently I was walking down the hallway with an arm load of laundry when I happened to glance into our Green room, and saw the afternoon sun filtering through the window. It brought me a moment of pleasure and gave me the idea to dedicate this week's blog to visual gratification that highlight even the busiest of days. I don't know if it's true for everyone, but for myself the beauty of the most ordinary things can fill me with a sense of tranquility and joy, feelings that are restorative and vital. During difficult times it's seems essential to find something that uplifts the spirit. Dahlias have always been the most practical flowers in our garden. They're not my favorites, but they are abundant and long-lasting. I have never lived in a house before this one, where I could so easily track the voyage of the sun across the sky and observe its effect throughout the whole year. Light plays a significant role in our daily lives, from sunrise to sunset. Interesting shadows on the front terrace. At the end of the day, when the sun is low in the west, it paints the hills golden. The white farmhouses on the distant hillside glow. We never seem to tire of these little charming moments. In past years, August has not necessarily been our busiest month at Maison Conti. We put that down to the fact that most of the French go on vacation in August and generally head to the beach. This year, however, we have clients every day. It means our time is filled with chores. Sometimes we can find ourselves at home day after day without a break. Last Sunday we organized ourselves to get out of the house and into the countryside between clients checking out and those checking in. Just a few hours away can offer deep refreshment, particularly when there is such pretty scenery surrounding us. We took a walk on a trail not far from home, that we had not discovered before. So many small roads lead to forested areas, and France is full of marked walking trails. During this hike, you pass through a verdant patch with berry bushes hugging both sides of the trail. It is just beginning to be blackberry season, and we snacked ourselves along the path. Berries in every stage of development. We recently learned that forest covers almost 30% of France. Our area has some of the most productive forested land in the country, and almost all forests offer public access and well-maintained hiking trails. In Montmirail our commune takes very good care of our forest trails. Our walk ended at the moulin in Avezé on the river Huisne. We did find ourselves in La Chartres sur le Lior one day in June and discovered then that the shop is only open one day a week, Sunday. So last weekend, while James and Daniel were with us, we made a plan to go visit. Before leaving home we verified that the shop wasn't closed for vacation via SMS, which is the only way to reach the proprietor. We were informed that the hours are 11-13h! Obviously moving the merchandise is not a tremendously high priority. That became even more evident when we arrived. 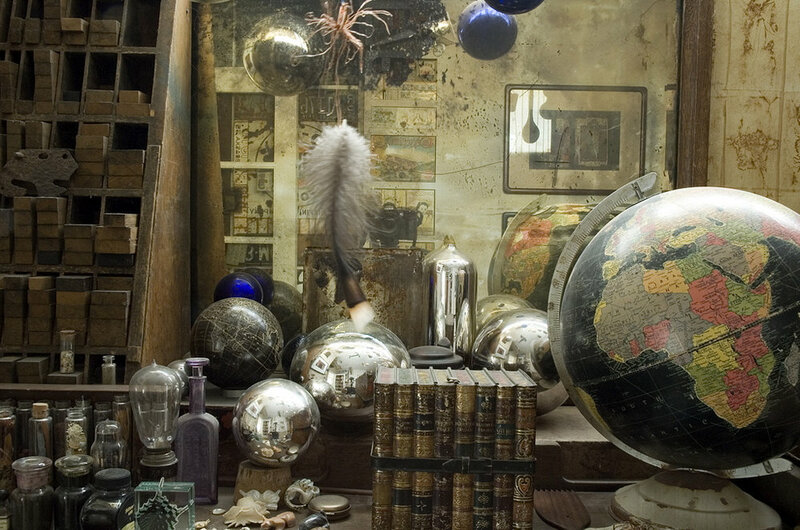 The shop is so beautifully arranged, and so full of treasures and curiosities that it certainly provides extraordinary visual pleasure, but there is not a bargain in the place. In fact the prices are so high, it became clear that selling is far down the priority list of the owner. The price tags were at least double or triple what one would pay even at the Paris Flea Market and bargaining is not an option with this guy. He calls himself an antique dealer and scenic designer. I think his talent is for the later. The shop is a pleasure to visit and provides lovely little still life arrangements and photographic opportunities, but I can't imagine I will ever be able to buy anything from this charming shop. Closer to home we have this Brocante, not quite so beautifully arranged! We visited yesterday and although it is a mishmash of items both in and outside the shop, there are wonderful things to discover, and the quoted price is never the firm price. I got this lovely and totally functional whip for 7€. The week has been cool but pleasant. James and Daniel, who have been in Paris for the month of July, came to visit for a long weekend. Coincidentally it was the weekend of our village yearly Medieval festival and Emily and family arrived as well, making for a lively and memorable few days. The new owners of the Château of Montmirail, have exerted their influence on our village. After renovating the castle, they have worked to integrate it into village life, by offering public events throughout the year. During the summer we have had concerts in the music room and picnics in the park. It has become a very friendly place. There are even plans to make a restaurant in the currently abandoned stables over the coming years. Certainly there is a lot of positive energy and more conviviality in the village than during the last few years. This is our tenth summer at Maison Conti and thus our tenth Medieval festival. The activities were much the same as in years past. The vendors/actors and presenters are part of a cadre of folks who spend their weekends touring France to similar village festivals, popular all over the country. This year almost all the activities took place on the castle park. There is always a big banquet offered on Saturday evening. We went with James, Daniel, our neighbors and another village family. Two enormous beef shanks turned on a spit throughout the afternoon. There was enough meat to serve a couple of hundred people. If you were a vegetarian, you were out of luck. It was enjoyable sitting among the crowd with friends and relations, and watching the sun go down. Meanwhile we had music and other entertainments. The dramatic finale was a huge fireworks display over the castle walls. Daniel keeps Rick company at the barbecue - photo by James Wilson. Even better were our family meals together. Everyone, with the possible exception of myself, loves to cook and many tasty dishes are always rustled up whenever the family gets together. Jos bought us a new family game called "Concept," and we literally spent hours playing it. It's a game for the whole family, and interesting for all. I highly recommend it to you. It's been many months since visiting with you via this blog. I've resolved to try to be more communicative, starting today. I have a little catching up to do, but going forward, I hope to more regularly keep you in the loop with what goes on in our little village. This year, due to the rather dramatically cold winter, we had a bumper cherry crop. We couldn't keep up with the harvesting. James, who is in Paris for the whole month of July, visited for a few days at the beginning of the month and took the lead in picking and processing. He spent an afternoon making preserves and desserts. They were absolutely delicious, both as fruit and prepared delicacies. Puttering in our garden, a five minute walk from the house, is a pleasant way to spend an afternoon. The patch is behind the castle walls, where few people walk past and there are no houses in the immediate proximity. The avian life is boisterous and butterflies of many sizes and colors are abundant, not to mention the bees, the lizards and a determined mole who share the space. We can't get up to the garden every day during our busy time of year, but we appreciate every opportunity. Quinn and Zinnie spent some days with us while their parents were at work in Paris. We actually shut down the business while they were here so that we could enjoy our time together. James came along too. we went boating on the lake in La Ferté-Bernard, we went to nearby water slides, we played games, did art projects and read together. Quinn is eight this year. Zinnie is five. 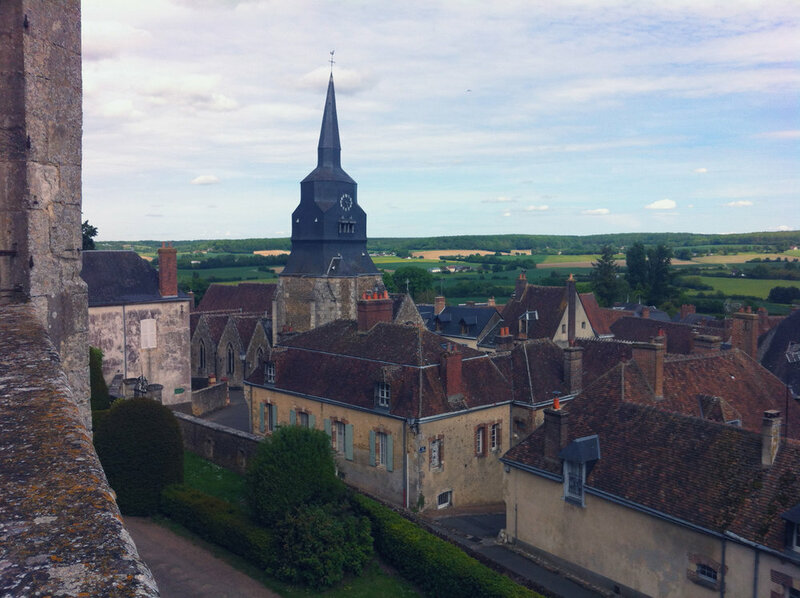 One afternoon we took a ride through the forest of Bellême in an antique cart driven by two Percheron horses and guided by the mayor of a little town on the edge of the woods. At home, we spend what extra time we have in the atelier. Rick has taken up a new hobby, dying with natural dyes. He's been able to create a rainbow of delicious tints. I repainted the print room earlier this summer, making it fresh and cheerful. Rick helped me create a new copper wall, which you get a glimpse of in the photo. It's made from old copper etching plates that I've collected over the last many years. I had an idea they would make a very nice wall covering, and they do. Since I haven't posted here since France elected a new young and dynamic president, I will close this week's communique with one of my favorite political photos, borrowed from the Guardian Newspaper. It was taken by the photographer Eric Feferberg and depicts Macron giving his State of the Union speech in front of the congress in Versailles. The French really do know how to do grand. 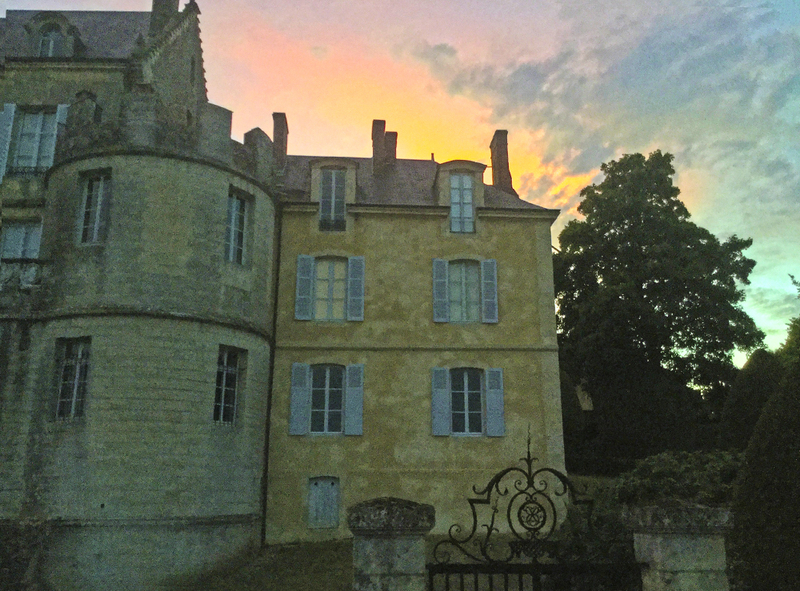 The evening sky reflected in the windows of the château, as seen from our dinning room. 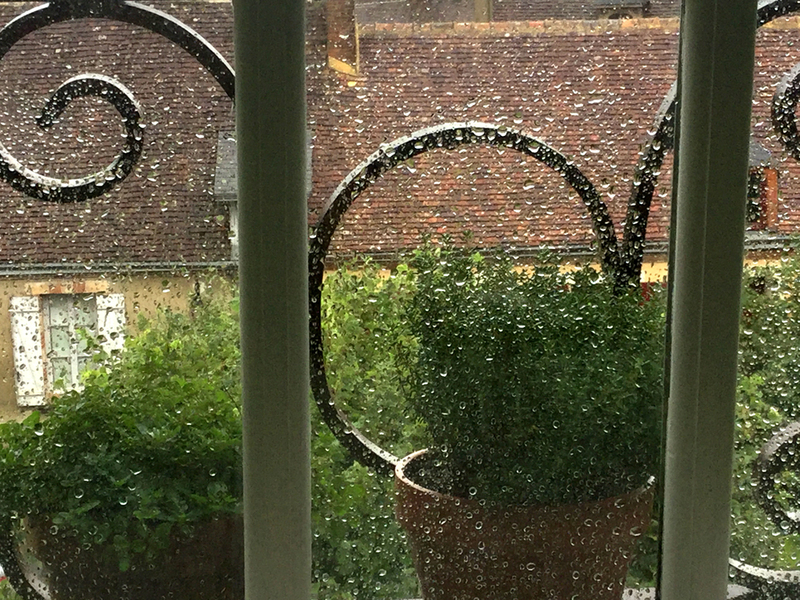 The weather has turned positively summery this week. The weeks before have been punctuated with a certain amount of rain, leaving the countryside now as green as green can be. When we visited the château earlier this week, I was struck by the incredible views from every window. The renovation work is nearing completion, and it was very nice to see the rooms furnished. I took photos of only the dinning room, as that was were we were alone waiting for Dominique, our friend, and the general contractor, who gave us a tour. I felt shy about taking out the camera once we were with him. The black and white stone tile floor looks very nice with the light celadon of the walls. Dinning room doors lead out to a terrace that looks over the entire village and countryside. From above I get a sense of the ancientness of the village. I love the textures and muted colors, the red tile roofs and our own roof line, which is almost unique in the town. Our house looks so small from this vantage. The endless rolling hills and hedgerows as far as the eye can see are a soothing sight to my eyes. The restaurant, still in ruins after the fire of several years ago, is expected to be rebuilt soon. I can hardly wait. We saw this double rainbow late last week, towards dusk, with yellow light painting the fields beyond. The canal as seen from Bastille. We were free last weekend, probably due to the fact that most travelers stayed home to participate in their elections. We took the opportunity to visit Emily and the kids in Parsi. Jos is in Australia at the moment, shooting a movie. Emily had given me a crafts class in Paris for my birthday at a very nice place in Oberkampf, named Seize. On Saturday we took a workshop together, making wall hangings. Sunday was the election and Emily took us along to her friend's house in Belleville, where there was an election party. On Monday we went into Paris to visit Monet's waterlilies at the Orangerie. Ever since finishing Ross King's book, Mad Enchantment, about the last years of Monet, I have been wanting to revisit these paintings. Our friend Nelly accompanied us. Here are a few photos for your entertainment. Seize, a very charming boutique and workshop in Paris. After class we did a little shopping in the Oberkampf neighborhood, which is ultra bobo. My friends from Santa Fe, the artists Gail and Zack Rieke, and Nelly, who lives in Paris, came to visit last week. Over the past six years Gail has offered several workshops at the Maison. This time she came just to visit and see the area, which she hasn't previously had time for. Every day was better than the last in terms of weather and spring springing. I took so many photos. I thought you might enjoy coming along with us on the adventures we took. The driver of the Deux Chevaux arranges flowers at church each day. Her friend has something to tell her. Rick has been working for the new proprietor at the château during the last month. The new owners liked the way the lime wash looks in our house and asked Rick if he could help them achieve the same thing in the guest rooms they are redecorating. He's gotten to know all the other contractors and has permission to bring friends and family for tours. He showed off the rooms he has finished. Out the window is a view of roofs, the valley and the back of our house. Before leaving the castle grounds, Rick took us to the "glaciere" which is essentially a mammoth-sized hole in the ground where ice, layered with straw, was piled up in winter as refrigeration for the castle before electricity. The walls of the passage leading to the deep hole are covered with ancient graffiti and vendors' calculations. Gail, Nelly and I did a collaborative collage project in the atelier one day. I always find that I get inspired and filled up when I work with Gail. She has a wonderful way of seeing possibilities and solving problems in ways that never fail to open my eyes. Nelly and I like to work together and when we're both free we often do. In my last blog post, I put up some photos from our drive to Le Loir, the river valley north of La Loire. I have more to share. On the way down the road we saw these stupa-like sculptures on the side of the road. Rick drove right past, not noticing them, but the rest of us simultaneous called out "wait, stop, turn around." We got out and spent quite awhile walking among the rows of this installation. Not what one expects to see in the deepest France profonde. Years and years (and years?) of someone's obsession and artistic expression, shared with whomever wishes to stop and have a look. Fine craftsmanship mixed with kitsch. Our second adventure together was to La Loire, the more populated and well-known areas, which Gail and Zack had never actually visited. First stop was Vendôme, an elegant city with lots to recommend it. 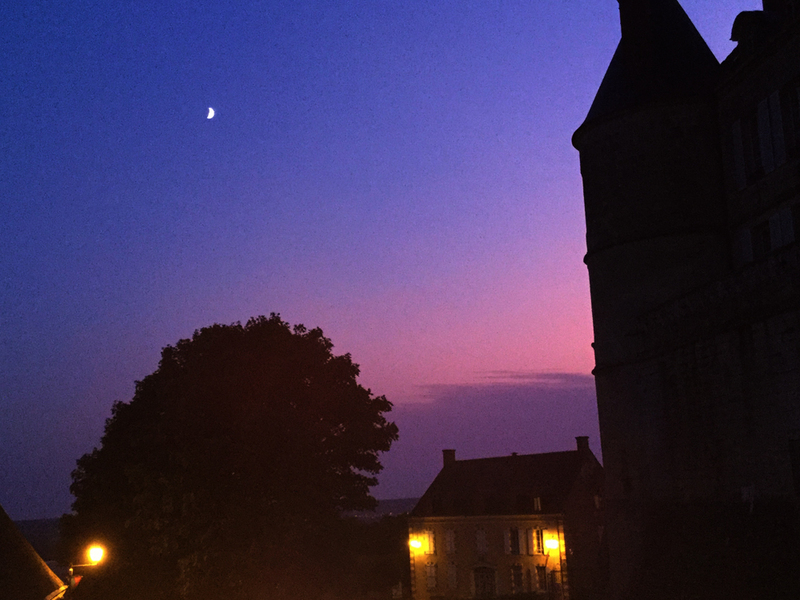 After coffee and a walkabout in Blois, we drove to Nelly's house in Beaugency for dinner. She has her apartment in Paris, where she mostly lives, but she also owns a very charming house on the river. Happy spring and Easter to all. Several people have told me that they have subscribed to my new blog, but are not receiving daily emails. The subscription feature is not working on the blog and I have not been able to trouble shoot it yet. If you return to the blog and enter your email in the field "follow by email," that should allow you to have an email in your box from me every week day. For this to work, you have to verify your email address after you enter it on the blog. We discovered the most wonderful shop which had just opened that morning. When we got back to the Maison after having been away for a couple of months, it was my atelier I was most anxious to see again. The first thing I did was an early spring cleaning which involved rearranging the furniture, scrubbing from top to bottom, and even rearranging my books. After all that I was happier than ever to wake up every morning and rush down to my work/fun space. While I was out of town, I spent a certain amount of time reading art books and watching Youtube videos of artists at work. Stuart Shils makes monotype prints and even more than his actual images (which are very nice) I liked his studio space, especially his work table which is covered by a huge sheet of glass where he can freely mix his paints. Rick bought me the largest piece of thick glass he could fit into the car and helped me fix up a pleasant workstation in the press room. I got busy trying out the monontype technique that Shils talks about in his demo video, basically painting on an old etching plate and putting it through the press. The monotype technique I was more familiar with was using a piece of plexiglass to paint over drawings as a guide to work from (as in the photo below). These are ways of working which I don't use often. With my new work surface it is easy to experiment with the method. I also read a book by Carol Marine, called Daily Painting, which very clearly discusses the popular artistic movement A Painting a Day, that has been around for about a decade. Several years ago Emily directed a clown show in Paris and introduced me to one of the musicians for the piece who is married to a daily painter, Julian Merrow-Smith. It was my introduction to the trend. The idea that Julian was supporting himself from a postcard size painting he undertook each day was certainly impressive, but the thing which struck me even more was that while following his blog, his artistic development was plain to see. The discipline was definitely improving his ability as a painter. Laziness and a desire for self-command are frequently at odds within me, so while I have always thought that this was a wonderful idea, I have been rather nervous to undertake it myself. It requires the commitment of posting an image each day and having something new and relatively worthy to share at high frequency. It is an intimidating personal project. Besides which, I am really not a painter. However the book and new monotype painting station managed to coincide in my mind and excite the concept of a print a day challenge for myself. Today, I am launching a new blog, on blogger.com where I will be posting montotypes, traditional etchings, collage, perhaps even cyanotypes on a more-or-less daily basis. I'm going to try to keep it going on Mondays - Fridays, as long as life gives me the time and space and ambition to pursue the project. You are certainly invited to subscribe to that blog. The blog you're reading now will remain more a slice-of-life occasional report, with far fewer posts now that our season is getting under way. Today was our last day in Greece with the kids. Tomorrow we fly back to Paris and from there we head back home to turn our attention towards the next season at Maison Conti. We drove up through the Pelopennese, crossing the Corinth canal and stopped at a hotel on the mainland coast. The journey was about three hours. I leave you with a few views of the Bay of Megara. I'm not sure when I'll be back to the blog, but I appreciate your company for the last weeks, and all your kind comments. We began the day by crossing the river Styx into the underworld, locally known as the Diros Caves. It is a huge series of grottos, navigated by boat. We took a counter-clockwise tour of the Mani peninsula though hardscrabble villages carved into the steep mountains. We visited the temple of Poseidon where we laid our offering next to all the others left by travelers before us. It's hard to imagine the kind of rough existence which people have eked out here over thousands of years. Currently the population of the area is 5000 hardy souls, but 200 year ago, 60,000 lived here. Around every bend in the road is another beautiful view. This is the southern most point of continental Europe.